This would go on almost every night since he was about two weeks old. By the time my son was about seven weeks old, I was going out of my mind. I went on to Amazon.com to look for some sort of book on stress relief and relaxation to help me calm myself. The strange thing is that when I did a search for these books I found Dr. Harvey Karp's book "The Happiest Baby on the Block". Dr. Karp mentions in his book that babies are comforted when their surroundings are similar to what they've experienced when they were in their mother's womb. In order to recreate that experience for your newborn you need to apply what Dr. Karp refers to as the "Five S's". The five S's help your newborn baby feel at home so to speak. Without going into too much detail but enough so that you can understand, I will try to explain the five Ss and the reason for them. If you want more information then I suggest purchasing the book. Dr. Karp goes into great detail explaining why the five Ss work and other health issues regarding your baby i.e. Shaken Baby Syndrome, SIDS. In addition, he discusses that many cases of colic can be cured by following the five S's. So let me first give you a breakdown of the five S's and then I will explain how we applied them to get our son to sleep through the night when he was just seven weeks old. The first step in the process of calming a baby involves wrapping them up nice and tight. Swaddling your baby correctly, helps mimic the tight surroundings of the uterus. The problem with this step is that many parents cant seem to get it right. Dr Karp provides an illustration on how to swaddle a baby properly; however, most parents don't have large enough blankets that would allow the process to be done correctly. In addition, many parents don't swaddle their baby tight enough. I know I had a hard time with it and I had to keep doing it repeatedly. For swaddling to work right, it has to be tight. The tighter the better. Furthermore, I have heard from friends that they have tried swaddling but their baby hated it because he/she liked having his/her arms free. Dr Karp mentions that newborn babies really don't even know that they have arms. Since their arms are a distraction, it's important to swaddle your baby. The bottom line is that every baby likes to be swaddled. While it's true that a baby might start crying when she's first being swaddled, they usually calm down after a minute or two. Placing a baby on her stomach or side can help keep them content. According to Dr. Karp, babies have what's called the Moro reflex. When a baby is lying on her back she may feel like she's falling. This feeling can trigger the Moro reflex and the baby will start thrashing and crying. You can prevent this reflex from being triggered by placing your baby on her side. 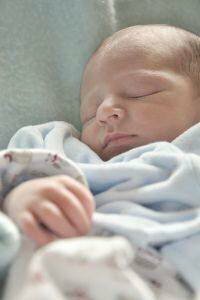 However, to prevent Sudden Infant Death Syndrome (SIDS) Dr. Karp advises parents not to place a baby to sleep on his side or stomach. The heading for this technique should really be 'Noise'. According to Dr. Karp, the noise level inside a mother's womb due to blood rushing through the arteries was equivalent to that of a vacuum cleaner or hair dryer. Therefore, anything that produces this level of noise will make them feel at home and help keep them calm. One great way to quiet a crying baby is to go "shhh" loudly really close to their ears. The shushing has to be louder than the baby's crying in order to work. When we would travel, we would place a small handheld weather radio tuned to static on our baby's car seat. This really helped in keeping him calm. At home, we would place the radio on the tray of the baby's swing. According to Dr. Karp, babies in their mother's womb have become so accustomed to movement that it becomes difficult for them to adjust to the stillness of a bassinet after they are born. Babies love movement. They love being rocked and jiggled. Dr. Karp provides several different jingling techniques in his book that could help to calm a crying baby instantly. A baby swing is a great tool and when used with the other techniques it will help keep your baby happy for hours. To get our seven week old to sleep through the night we applied three of the five 'S' techniques. The main reason for the 'side' technique is to calm a crying baby. Dr. Karp mentions that once the baby is calm you should be able to put him to sleep on his back (of course he will need to be swaddled well and sucking on a pacifier). Swaddling was the most challenging component for us. The problem with swaddling is that even if you do it right it doesn't take much for it to come apart. Every time we moved our son, we had to re-swaddle him. We also couldn't find a blanket that was large and thin enough to swaddle the way Dr. Karp illustrates in his book. We tried all sorts of things. I went to baby stores to try to find something that would work right. We bought the "SwaddleMe" blanket but it was terrible. The fabric was way to stretchy and thin, the Velcro didn't stick well enough, and the swaddling wasn't nearly as tight as it was supposed to be. After doing some research online, I found a product that had excellent reviews on Amazon. It's called "Miracle Blanket" and it's probably the best modern day invention for parents with healthy newborns. I can't praise this product enough. The material was of great quality, the swaddling was tight, and the baby could stay wrapped up the whole day just with one swaddling episode. Instead of me trying to explain why and how this blanket works so well, just check out the product website. There's a video right on the home page showing a baby being swaddled. My only issue with the product was its price. I couldn't find it anywhere local and it cost close to $40 once you add shipping and tax when ordering it from their online store. However, you could find it for less than half that on eBay. So in the end, we bought a used one that was in great condition from an eBay auction for $20 including shipping. So that's what we did. We got our son a pacifier that stayed in his mouth. We swaddled him up nice and tight with the Miracle Blanket. And we placed him to sleep on his side.